Once Phil Pitts mentioned that “there was quite a write-up in the paper…” I had to look into it myself. Lovely Liz Creighton (formerly Elizabeth Murphy) had been a resident of Lewiston her entire life. Hard-working and well-respected, she probably never imagined she would find herself fighting for her life at St. Mary’s hospital, Niagara Falls, one fall morning, following a brutal assault. The story begins in early September of 1907. Liz was merely going about her own business, keeping house in Lewiston, with only her little boy and her aged father to keep her company. Her husband, Thomas, was often away in Toronto as he worked as a baggage man on a steamer. On this particular day, Burt Carpenter, well known across the area for his drinking problems and offensive behavior, a desperado, found himself at her front door. It is believed that the Creighton house was located on Sixth Street near Onondaga. He attempted to effect an entrance but Liz made every effort to keep him away. As she barred her doors, he went for the windows, smashing them to pieces and damaging the house to a great extent. She screamed for her life and several neighbors responded. They were able to hold Carpenter down until the constable arrived. Liz called upon the Justice of the Peace and swore out a warrant for his arrest on charges of disorderly conduct. Carpenter was then taken away. But the story does not end happily ever after. The following day Elizabeth Creighton appeared at the hearing. Carpenter was found guilty and sentenced to 60 days hard labor. As Liz attempted to remove herself from the court room the court attendant came out with the prisoner in his charge. 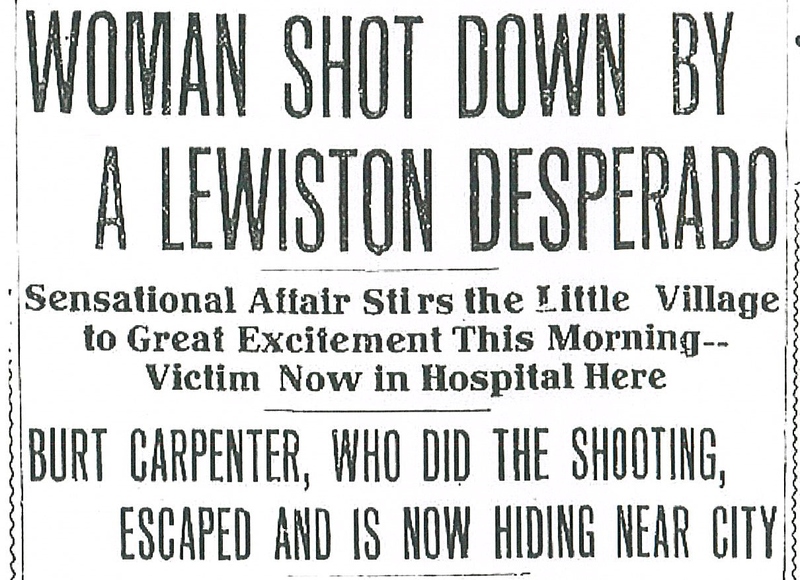 As they passed Mrs. Creighton, Carpenter suddenly drew a revolver and fired two shots at the woman. One bullet lodged itself within the woman’s body. Great excitement prevailed throughout the court room and in the confusion Carpenter escaped. He ran out into the street but not without flourishing his revolver in the faces of the innocent bystanders. He stopped to reload at one point and then took off down Fourth Street in the direction of Niagara Falls. Mrs. Creighton was gravely wounded. She was placed aboard the New York Central train that left Lewiston at 10:00 and arrived at the hospital in Niagara Falls by noon. The bullet that had entered her body passed through her left side just below her heart. For several weeks, Liz lingered between life and death. She eventually survived the ordeal. Remarkably, Carpenter was not apprehended until the following year after being arrested in Charlotte, Michigan, on suspicion of complicity in a safe cracking job in that city. Somehow he had evaded the authorities for a very long time. In the end he was sentenced to twenty years in the State prison at Auburn for his assault upon Mrs. Creighton. Below is the notation revealing his prison term. Click on images to make larger. Carpenter was not new to a life of crime. In fact, he had quite a personal history of acts of violence. Just about ten years before the incident involving Lizzie Creighton, “half drunk and in an ugly mood,” Carpenter met with Constable James Townsend on the hill leading from the boat docks and up into the village and without warning drew a revolver and “blazed away at him.” The officer drew his own weapon and was able to strike Carpenter at least once (in the eye). Both men survived the ordeal. 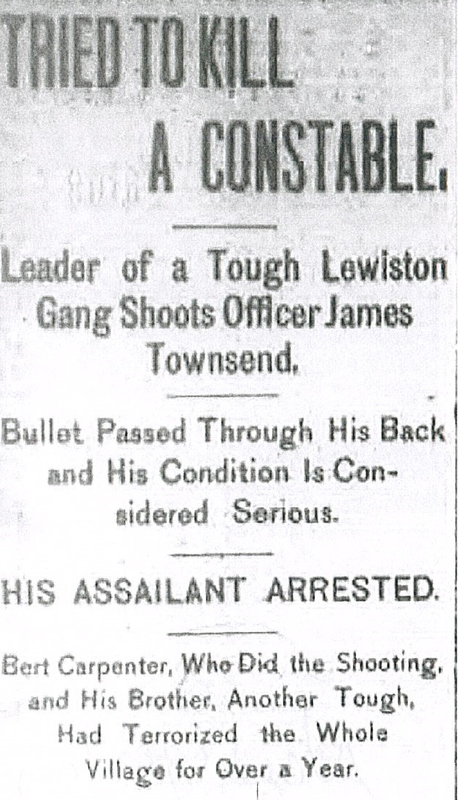 During this most interesting time Lewiston was the scene of mayhem and lawlessness. It was written in the local papers that a terrible rash of burglaries, petty thievery and highway robberies had become the norm. “A gang seemed to have organized among the tougher element, who had complete control of and held in terror the entire community.” Burt and his brother, Charles, had been under close surveillance for some time. They were considered possible leaders of this gang of criminals. The brothers, who lived with their parents east of the village, were thought to be responsible for several local crimes. Charles Carpenter had been arrested following a Lewiston post office robbery in which marked bills were found in his possession. Burt had been arrested following the burglary of Clapsaddle’s store (out in the country). However, in 1905, a strange turn of events landed Carpenter as the victim–with a blade to the stomach. After a brawl at the Iron Dollar Saloon at Lewiston, in late March of 1905, Constable Butler (who owned the establishment) knifed Carpenter. The occurrence took place following an earlier incident at the Iron Dollar Saloon in which Butler had had to subdue Carpenter by hitting him over the head several times with a bottle. It was said that Carpenter was looking for an opportunity to get even with the constable. On the particular night in question, the Iron Dollar Saloon was the setting for quite a commotion. Carpenter had caused quite a ruckus…however, the law wasn’t playing around anymore. Butler did not hesitate to rough up Burt Carpenter when he had the chance. 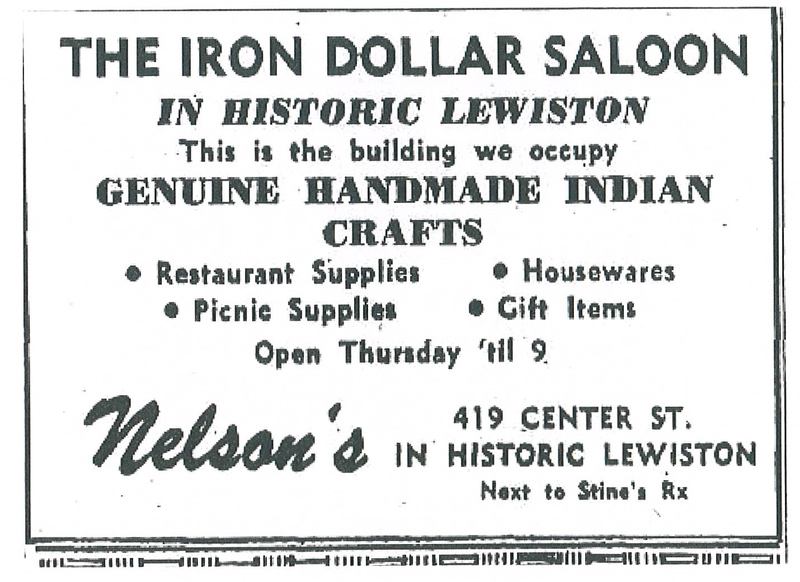 It appears the Iron Dollar was located at 419 Center Street.